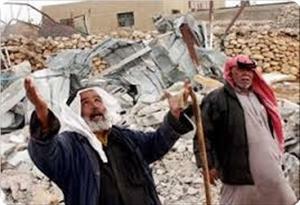 Israeli authorities on Thursday demolished the Bedouin village of al-Araqib for the 54th time. Resident Aziz al-Turi said Israeli forces arrived carrying weapons and batons to intimidate villagers in Al-Araqib before bulldozers tore down all the homes in the Negev village. 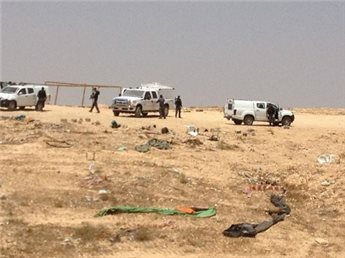 Israeli authorities also bulldozed homes and buildings on Thursday in the Negev village of Abu Qreinat, resident Maher Abu Qreinat told Ma'an. The Israeli government in January approved the Prawer-Begin Bill, calling for the relocation of 30,000 - 40,000 Bedouin, the demolition of about 40 villages and the confiscation of more than 700,000 dunums of land in the Negev. 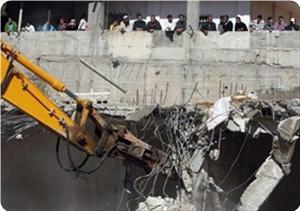 Lawyer Salem Abu Mdaghem on Thursday called for serious attention to the Prawer plan. "Arabs of the Negev must deal with the Prawer plan more seriously by ignoring their problems and clashes and focusing on Prawer because this plan will not differentiate between any of them," he told Ma'an. "What is needed is to form a popular committee to include all factions and national movements to set a struggle plan to raise the voices of people in Negev who reject the Prawer plan. "Every day that passes without a reaction against this plan is a crisis day for the Negev and its people," the lawyer warned. UN human rights chief Navi Pillay slammed the bill in July, urging the Israeli government to reconsider its plans. "If this bill becomes law, it will accelerate the demolition of entire Bedouin communities, forcing them to give up their homes, denying them their rights to land ownership, and decimating their traditional cultural and social life in the name of development," Pillay said. The government has said it would "as much as possible" grant legal status to Negev villages that are currently unrecognized by the authorities if they met a minimum population criteria. But those criteria have never been stated. A cabinet statement has said "most" residents -- who do not currently receive government or municipal services -- would be able to continue living in their homes after the villages are granted legal status. 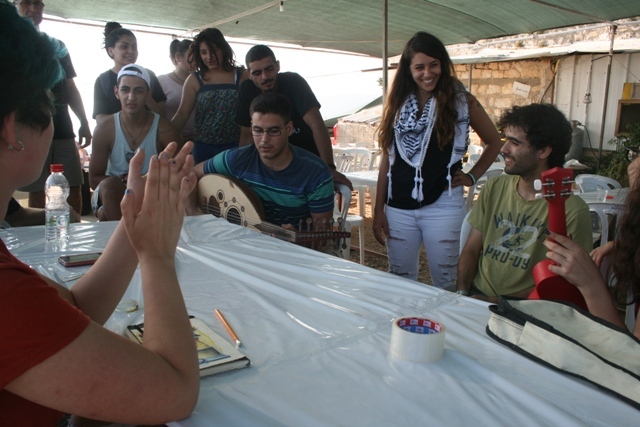 The displaced members of the village of Iqrit marked one year since their groundbreaking direct action: the return of the village youth to the village, the revival of its traditions and the strengthening of their hold on the land. Although they are now celebrating with friends and supporters, they fear a potential response from authorities. 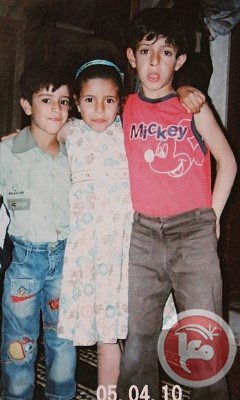 Every year for the past 18 years, the displaced Palestinian community of Iqrit has organized a summer camp on the expropriated lands of their village so that the younger generations, born in cities and towns elsewhere in Israel, will remember their heritage and continue the longstanding struggle for return. Yet this year’s event, which continues until Sunday, is particularly joyful, and more festive than ever, as a group of third-generation Iqritians have been able to resettle on their lands and maintain a sort of settler-style outpost for exactly one year. Six months ago, photographer Oren Ziv and I visited them for a Haaretz story (Hebrew) and a shorter +972 version - it was now about time to go back and see how they were doing. About 100 children and teens, age 8-18, are spending this week on their ancestors’ lands. A group of students who are slightly older serve as guides, the parents help out in the kitchen and workshops, and the older folks come to tell tales of the days before the IDF drove them out in 1948, and before their homes were blown to bits on Christmas Day in 1951, despite a court order mandating the villagers’ return. Over the course of one week, the entire village is revived, with tents erected around the still-standing Catholic church and between the rubble of what was once the school, the mill and people’s homes. The children learn their family histories, recite the meaningful turning points in their struggle for return, dance and play. This year, they also saw a new hope flourishing on the Iqrit hilltop: village relics have been unearthed, vegetables and herbs of sorts are starting to paint the church surroundings green and the children’s guides and older siblings can tell them firsthand how it feels to be living on their own land. Many supporters have come to visit this summer. On Wednesday, the visitors were a group of Jewish teenagers who had just concluded the week-long Alternative Youth Summer Camp on Friday (an initiative which I co-founded eight years ago and am still very much involved with, and which offers young Israelis a chance to discuss politics, economy, gender, ecology, the military draft and more in a safe, supportive and fun environment. The camp is sponsored and supported greatly by New Profile). The meeting between the youth from the two camps was fascinating to watch. At first, after getting to know each other, they discussed the Nakba, how much either group knows about it, how they learned about it (as both Jewish and Arab schools are forbidden from discussing it) and how everybody feels about it. A 14-year-old girl from the Tel Aviv area told of a teacher who was fired for presenting the Palestinian narrative of the 1948 war alongside the Israeli one, and a youth from Iqrit who now lives in Haifa told of his own teacher, also originally from Iqrit, who hides his family’s history from his students out of fear of the Ministry of Education. They went on talking about the experience of being a minority: either as leftists in Israeli society, as Palestinians in Israel, or Christians in a mostly Muslim society, and then turned to ways of coping with such challenges and keeping struggles for equality and democracy going. After the discussions, everybody split into mixed workshops. Some went to garden, others improvised a jam session while others painted shirts with Iqrit-related slogans. 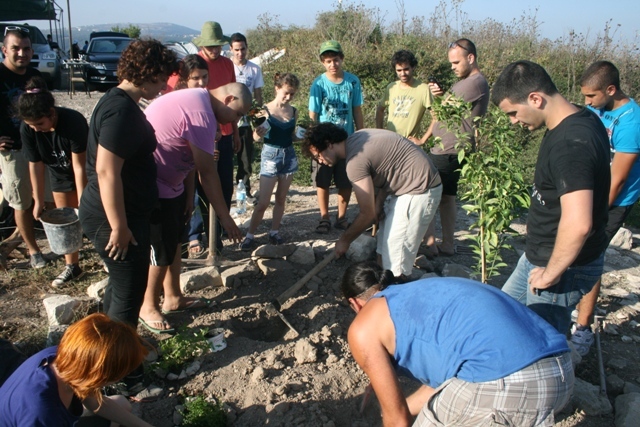 The visiting youth of the Alternative Camp were shocked to hear that the small garden and the tree they planted together will likely be uprooted by authorities and that a threat has already been issued by regional inspectors of the Israel Land Administration to destroy the soccer field local activists set up, should it not be taken down willingly at the end of camp. These continued threats against the village are backed with military patrols which frequently arrive at this civilian summer camp. (One appeared during our visit.) The returning people of Iqrit, however, are determined to keep on planting, playing soccer, unearthing relics and rebuilding small structures – until the return to their village is complete. Hebrew media sources revealed that the Israeli government seek to present a new law allowing it to confiscate lands and houses belonging to Jerusalemites who are charged of resisting the occupier. The Israeli Attorney General Yehuda Weinstein is due to present a new bill before the Supreme Court next month allowing the confiscation of Jerusalemite properties as a new punishment for those who are engaged in resisting occupation. The bill will enable the Israeli authorities to take control over the rest of the Jerusalemite properties, Haaretz Hebrew newspaper said. 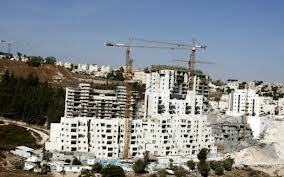 Properties seized in East Jerusalem under the Absentees Property Law would not be returned to Palestinians with a security record or connection to hostile elements, under new procedures being drawn up by Attorney General Yehuda Weinstein’s office that were obtained by Haaretz. Palestinians with security records won’t get back seized East Jerusalem property, the bill states. Under the Absentees Property Law, any person who lived in a hostile country or in the area of "Eretz Yisrael" that was not under the State of Israel’s control, and owned property within the State of Israel, is considered an absentee owner and his property can be transferred to the Custodian of Absentee Property, the newspaper said. The newspaper quoted lawyer Sami Irsheid as saying that there is no Palestinian family who has no relation with "hostile elements" according the Israeli occupation’s dictionary. Each Palestinian family has a detainee or a martyr, he stated. The primary purpose of this law was to use the Absentees Property Law to confiscate as many Palestinian properties as possible. Israeli forces Tuesday raided a car wash shop in the village of An-Nabi Samuel, north of Jerusalem, seized its equipments and handed its owner a demolishing order, according to the owner. Eid Barakat told WAFA that Israeli authorities have previously demolished his house under the pretext of being built without a permit. Israel refuses to issue building permits for Palestinians living in that village and other Palestinian villages forcing them to build without obtaining permits. The village has a residential population of around 250 Palestinians; Israeli forces prevent any Palestinian not resident in the village from entering it. The birth of a "Jewish state" in a country overwhelmingly not Jewish required a massive act of ethnic cleansing in Palestine. Between 1947 and 1949, Zionist militias executed this catastrophe by driving out some 750,000 Palestinians. This is commemorated as the Nakba. 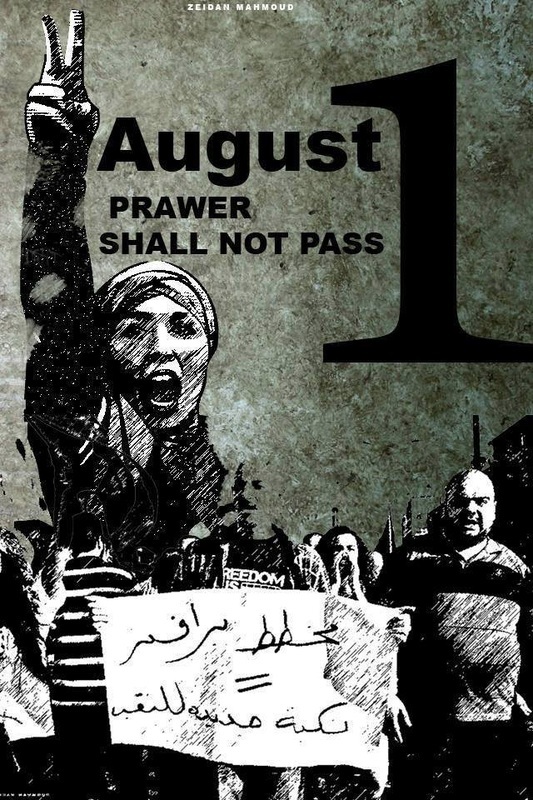 The latest incarnation of this on-going Nakba is Israel's Prawer plan. Passed by its parliament in June as the Prawer-Begin law, this new wave of ethnic cleansing aims to empty the southern Naqab desert (known as the Negev in Hebrew) of tens of thousands of Palestinian Bedouins. Israel's obsession with "Judaisation" means that around 35 "unrecognised" Arab villages containing 70,000 people could be destroyed to make way for what is euphemistically called "development." In reality, this is the removal of one ethno-religious group to make way for another. 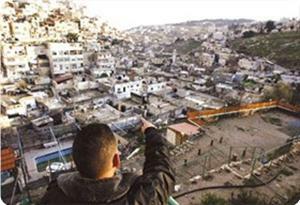 Arab villages will be replaced by forests, military centres and new Jewish settlements. Palestinian citizens will have their ancestral land seized. Older than Israel Adalah, the legal centre for Arab minority rights in Israel says Prawer would be "the largest single act of forced displacement of Arab citizens of Israel since the 1950s". According to the group, "If Israel applied the same criteria for planning and development that exist in the Jewish rural sector, all 35 unrecognised villages would be recognized where they are." The Bedouin are often slandered in Israel as "criminal" and "uncivilized" nomads. In fact Arab Bedouin have lived in villages since at least the 16th century, long before Israel ever existed. Most of the "unrecognised" villages (which Israel's racist state structure refuses to connect to services like water electricity, sewage, education, health care and roads) in fact pre-date the state of Israel itself. While the world's media focuses on the sham that is the supposed peace talks between Israeli politicians and the subservient quislings of the Palestinian Authority, a massive new wave of Israeli expulsions is about to take place. Emptying Palestine of its native population has never ceased to be a key goal of the Zionist movement. In many ways, the Nakba never really ended. After the initial trauma of 1948, Israel has continued its project of removing as many Palestinians as possible from the land, as both the West Bank settlements project and Prawer demonstrate. Israel's first prime minister, David Ben Gurion dismissively said during the Nakba: "The Arabs of the Land of Israel [i.e., Palestine] have only one function left to them – to run away" (Benny Morris, “The Birth of the Palestinian Refugee Problem Revisited”, (Cambridge University Press, 2004), p. 463. Editorial insertion in Morris). Back to the Nakba During the 1948 war, Israel broke a July-October truce. They "regularly harassed [Palestinian] harvesters between front line positions, behind the lines and in no man's land" (Morris, 445. Insertion mine). During this truce the Israelis "mounted sporadic 'clearing' operations to drive away concentrations of refugees who had temporarily encamped near the front lines ... the Negev Brigade continued harassing the Arab inhabitants and beduin tribes. On 16 August, the brigade carried out a full-scale clearing operation in the Kaufakha-al Maharraqa area. 'The villages' inhabitants and [beduin] concentrations in the area were dispersed and expelled. A number of houses were blown up. Muharraqa and the houses of Sheikh 'Ukbi … were mined'" (Morris, 446. Insertion in Morris). Unsurprisingly, the truce between Israel and the belatedly-intervening Arab armies collapsed 16 October. Visiting occupied Bir al-Saba' (Beersheva) on 30 October alongside Ben Gurion, the director general of Israel's "Minority Affairs Ministry" Gad Machnes remarked to one commander: "We have come to expel the Arabs. Yigal [Allon], rely on me." But by then many Arabs had already been driven out (Morris, 467. Insertion mine). "They will be in the way" In November 1948, Yosef Weitz, a Jewish National Fund director "wrote Ben Gurion that it was best that the beduin were not around. But, 'if political requirements' compelled leaving them in Israel, then they should be 'concentrated' in a specific, limited area." But he also worried about the future: "Weitz argued that leaving the beduin in place would result in a host of problems ... 'If we formulate a development plan for the Negev – they will be in the way'" (Morris, 526). By 1950, only 35,000 Palestinians remained the the Naqab. Their situation was precarious. While some had been given Israeli ID cards, many had not (Morris, 528). Some of the Bedouin community's leadership was co-opted by Israel, and all lived in fear of being made refugees like so many of their kinsfolk. All of Israel's Arabs citizens (but not its Jewish ones) would remain under a racist system of military rule until 1966. 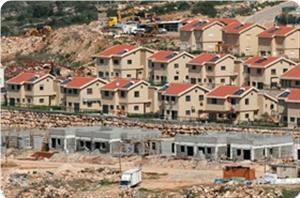 Today, the JNF continues to promote its racist "development" plans. One of these is a crackpot scheme by Christian fundamentalist satellite Christian fundamentalist satellite channel GOD TV, to build a forest on the land of al-Araqib, a Bedouin village that has by now been demolished so many times it's hard to keep count (its resilient villages keep rebuilding). GOD TV's sectarian end of times theology states that their purpose is "to prepare the Holy Land in expectancy of the Messiah showing their commitment to the Land of Israel" and they claim their "tree planting" will make "the deserts liveable once more." In fact, such claims are pure Zionist mythology. Palestinians have been making the desert liveable for hundreds if not thousands of years. Despite the severe limitations placed on them since 1948, the Palestinian Bedouin of the Naqab have stood steadfast in their land, and have grown to a population of some 200,000 today. Thankfully, Weitz's prediction that the Bedouin would "be in the way" of Zionism's schemes was correct. The Arabs of the Naqab are not going away, and Palestinians from all over the country are resisting the Prawer plan. Even if it makes short-term gains, Israel's project of sectarian expulsion is doomed in the long term. 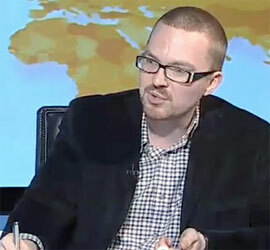 Asa Winstanley is an associate editor with The Electronic Intifada and an investigative journalist who lives in London. 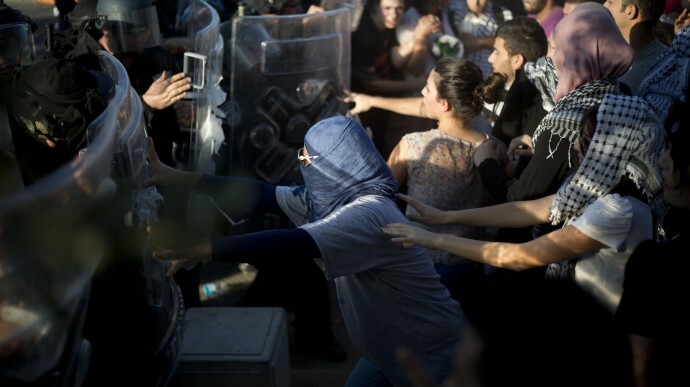 Israeli Arab and Palestinian women activists scuffle with Israeli riot policemen during a protest against the Prawer Plan plan to resettle Israel’s Bedouin minority from their villages in the Negev Desert, in the village of Arara, northern Israel, Thursday, Aug. 1, 2013. Israel's Knesset is pushing to pass legislation that would forcibly relocate tens of thousands of Bedouin citizens. As Palestinian and Israeli leaders assemble in Washington for their first direct talks in three years, the Israeli Knesset is pushing to pass legislation that will displace tens of thousands of Bedouin citizens in the Negev region of southern Israel. “A viable two-state solution is the only way this conflict can end—and there is not much time to achieve it,” Kerry said. But the overwhelmingly majority of Palestinians — including those who carry Israeli citizenship — do not share Kerry’s optimism. Doubts of U.S. and Israeli sincerity are only exacerbated by Israel’s latest plan to forcibly relocate the Bedouin population in the Negev desert. An oft-overlooked demographic within the already marginalized Palestinian minority, Bedouins make up around 30 percent of the region’s total population. 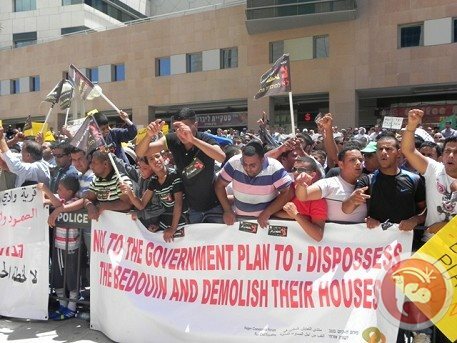 Between 2008 and 2011, roughly 2,200 homes were demolished by the state, resulting in the displacement of some 14,000 Bedouin citizens of Israel, the Negev Coalition for Civil Equality recently told Al Jazeera. Its projected consequences are quite far from ensuring equal opportunities, however. Around 30,000 Bedouins from 35 “unrecognized” villages will be forcibly relocated to bantustan-like townships approved by the government. While a great deal of those who are slated for dispossession live in villages that predate the 1948 establishment of Israel, many were also placed on their present lands by military decree following the state confiscation of their land following 1948. Far-right Prime Minister Benjamin Netanyahu’s Likud Party has spearheaded efforts to pass the Begin-Prawer Bill. In addition to the angry response from Palestinians across the map, organizations and political parties close to the Israeli settler establishment also have offered stubborn opposition to the plan, but for vastly different reasons: They argue that there is no need to compensate the displaced because “there is no basis to recognize Bedouin ownership of land” in the first place. “The government must recognize and respect the specific rights of its Bedouin communities, including recognition of Bedouin land ownership claims,” Pillay added. In response, activists in Israel and the occupied Palestinian territories have staged a number of coordinated demonstrations. Their message has been boosted by a handful of solidarity protests across the globe, particularly in the United States and Europe. 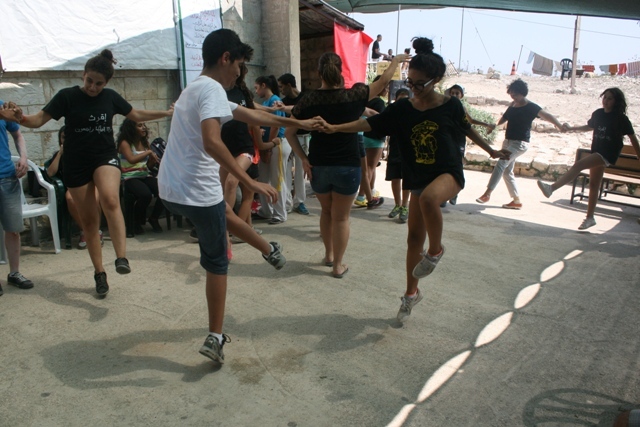 On July 15, a nationwide campaign brought out thousands in Beersheba, Jaffa, Jerusalem, Ramallah, Gaza City and elsewhere. A general strike was declared by the Arab Higher Monitoring Committee — which represents Palestinian citizens of Israel — leaving businesses and municipalities in Arab parts of Israel closed. Two weeks later on Aug. 1, demonstrators staged another ‘Day of Rage.’ Similar protests alighted across the country, accompanied by arrests and claims of indiscriminate and disproportionate force by police. “Since the Second Intifada, I haven’t felt Palestinians as united as they were last month [at the anti-Prawer Plan demonstrations],” Maria Zahran, a Palestinian human rights activist, told Mint Press News. She also reported that there was close coordination between Palestinians inside Israel and in the occupied West Bank. “There was a big push from the younger generations,” said Zahran, adding that youth activist networks were created to continue organizing after the Arab Higher Monitoring Committee announced it wouldn’t organize another protest after the July 15 strike. This coordination between young people birthed the Aug. 1 demonstration. Palestinian citizens of two states? Tzipi Livni, Israeli Justice Minister and chief negotiator, said history “is made by realists who are not afraid to dream.” But a quick survey of the discourse over negotiations shows that few see her dream of a two-state solution as realistic or desirable. Speaking in Jerusalem in March, President Obama pledged 3 billion dollars a year in aid to Israel for the next decade. In order to bring the Palestinian Authority back to the negotiating table, Kerry has sought to implement a four billion dollar investment plan to resurrect the lifeless Palestinian economy. Yet despite the immense financial resources being poured into the current negotiations, there is a growing consensus that the two-state solution ignores the basic national rights of Palestinians in Israel and those exiled in refugee camps. The Prawer Plan offers a grim peak into the potential future of those Palestinians left as a minority in Israel if negotiations bring into being a Palestinian state around the 1967 borders. Jerusalem: a city considered a capital by two countries and a key issue in the Israeli-Palestinian conflict. 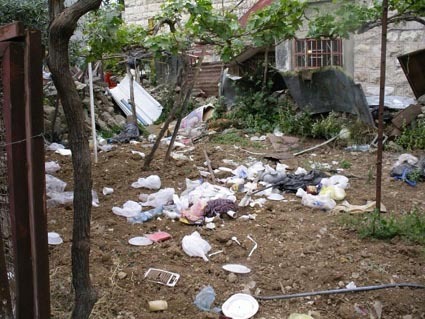 There is an ongoing ethnical cleansing of the city’s eastern parts that’s striving to remove the Arab population. The tool of the cleansing is a piece of paper, more specifically an ID card. We are now going to take a closer look on how. Around 2002 the separation wall was being constructed, cutting off East Jerusalem from the rest of the West Bank. The Palestinian residents of East Jerusalem were therefore given the blue Israeli ID cards to be able to stay in the area. 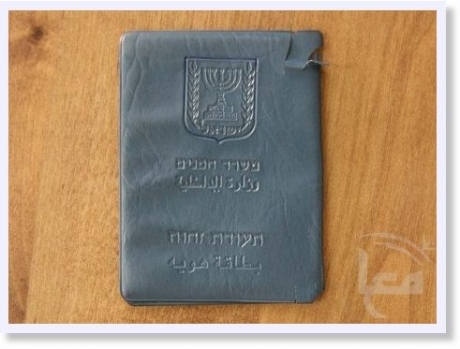 These cards however, do not make every Jerusalemite an Israeli citizen since the cards the Palestinians receive do not say “citizen” but only “resident”. These cards might seem like an easy ticket to secure residency in the holy city, but it is far from easy to receive. As a Palestinian you are not allowed residency in East Jerusalem unless both your parents lived in the area. This might seem ironic in comparison to Israel’s birthright-policy stating that it is enough having one parent of Jewish decent to be entitled to live in the holy land. However, this is the case for the East Jerusalemites, something that has resulted in thousands of unregistered kids with one non-Jerusalemite parent that would otherwise be deported. Along with this obstacle came another one in 1995 when the law called “Center of Life” was utilized by Israeli minister of interior. 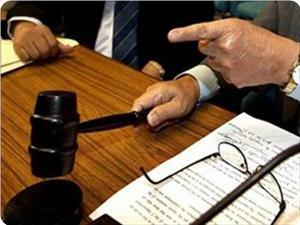 This law emerged from the ruling of Israeli High Court in a case from 1988, called the Awad-case. This was a case about the Jerusalemite Mubarak ‘Awad who went abroad to study in the US, when he later returned to Palestine and tried to renew his Palestinian ID he was dismissed, since the court considered his “Center of life” to be elsewhere than in Palestine. This case was later utilized and transformed into today’s Center of Life law. Applied to the situation for the people living in East Jerusalem, this means that if a resident of East Jerusalem for example gets a job outside of Jerusalem, their centre of life is no longer considered Jerusalem and their IDs will be dismissed. Since the center of life law was passed, this has created thousand of displaced persons. If any person manages to meet the strict criteria of the center of life policy, he/she will finally be given the blue piece of paper allowing residency in Jerusalem. The struggle will continue when the ID expires and needs to be renewed at the Ministry of Interior. The life of the Palestinian residents of Jerusalem goes on, depending entirely on a deceptive blue piece of paper. This is how the demographics of Jerusalem keep changing. It’s not a spontaneous demographic change; rather, it has been planned and implemented from the highest levels. 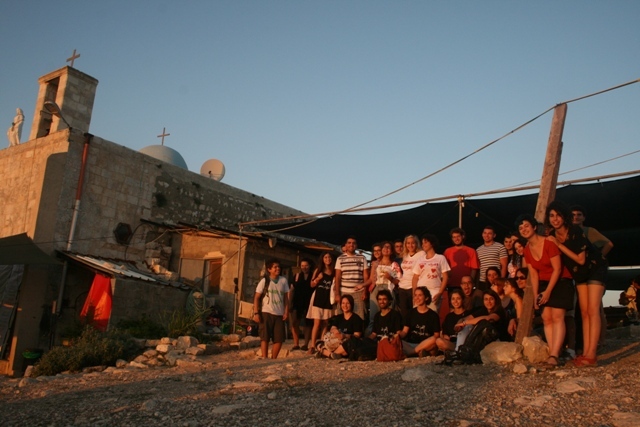 "By Heart and Hand We Change the Land"
The Tent of Nations, established in 2002, is located 7 km from Bethlehem on a hill 950 m above sea level surrounded by 5 Israeli Jewish settlements. Located in area C, which is under full Israeli civil and security control, it has become difficult to launch construction since Palestinians do not have control over land, resources or the borders. David Nassau and his family have owned this farm since 1916, dating back to the Ottoman period. However in 1991, the Israeli authority declared this farm as state land. David has been in a 12 year legal battle in military court and most recently the Jewish supreme court, causing a financial burden of nearly $150,000 for him and his family. 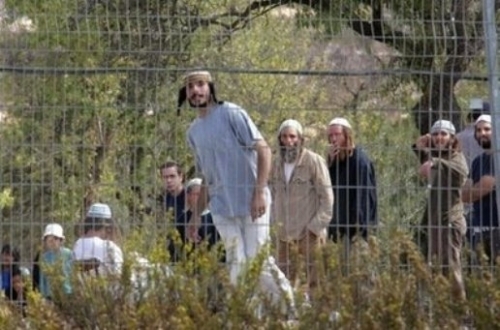 Since the establishment of the camp, Israeli settlers have cut trees, damaged water tanks, threatened with guns and attempted to build roads on the property. There have been 13 demolition orders for construction built without a permit because of the tents and shade for the animals. 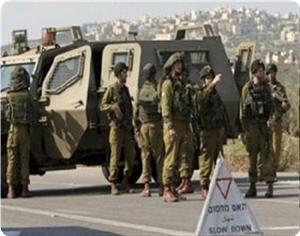 Since 1991, the camp has been in isolation since the roads have been blocked off by Israeli authority. One year later, 250 olive trees were demolished by Jewish settlers; however, 3 weeks later a Jewish organization sponsored the planting of 250 new olive trees, a beacon of hope for David and his family. The normal response to this injustice is violence or resignation. Neither is an option for David. He has created a 3rd nonviolent way of action by overcoming evil with good, hatred with love and darkness with light. 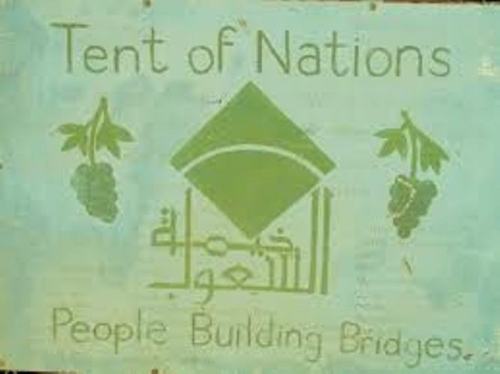 Under this slogan, he has founded the project known as the Tent of Nations. David has also introduced an array of educational programs and camps for Palestinians, the first being a planting project. David invites anyone to plant trees on his property, protecting the land and planting for the future since David believes "peace should grow from the bottom up." The second program David has established is the children summer camps which encourage Palestinian youth to discover their talents in art, music and various academic activities. David says "it is easy to fall into the victim mentality. I want the children to know that they are able to make a difference. They are able to shape their own future." Thirdly, David and his wife, Jihan, have implemented a program in the village designed to empowering women. Jihan teaches women who do not have access to proper education in computer, English, art and agricultural training. David says this is crucial since women are needed to play a role in shaping their society. A major concern for David has been developing such programs on the land without water and electricity. To fix the problem, David has created a rainwater collection system which can be used to water the garden and provide water for the livestock and irrigation. Also, thanks to generous donations, a solar power system has been implemented. David hopes that in the future he will be able to extend the panels and add 2 small wind turbines. His goal is to make the camp for people to come and learn and go back home with a message of hope. David hopes to accomplish these goals by channeling pain in a positive way. His main goals are to protect the land legally and without the use of violence, keeping hope alive for the 7,500 residence in the nearby town of Hebron. He also hopes to build bridges between land and people. In the summer camps, David along with 30 volunteers from around the world teaches the children about the environment and the concept of belonging to the land, to therefore build a better future for the Palestinian people. From my recent visit to Hebron, I was especially struck by the clear and intentional lines dividing life under the occupation. 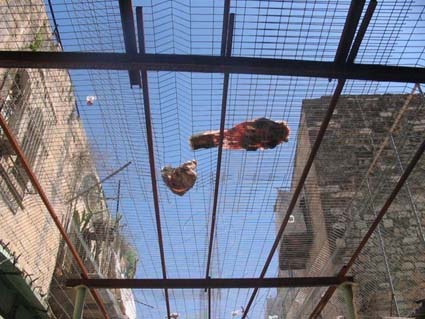 Above a richly diverse Old City market sits an Israeli settlement, separated only by a wire covering that captures the trash, rocks, and any other objects that settlers choose to throw off their balconies onto the Palestinians. Down the road from an established settlement, complete with a sign that misrepresents the land as "stolen" by Arabs, is a well-guarded passageway to enter the mosque and Palestinian market. 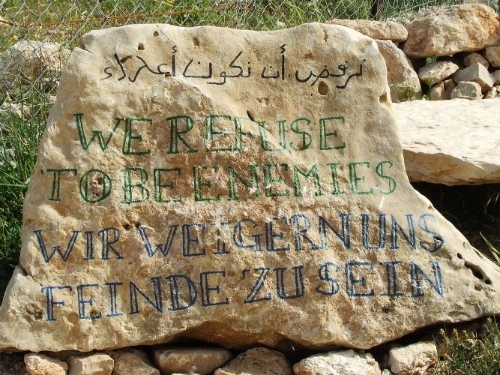 Across a tiny space between two yards, settler families from America look out over Palestinian advocates of nonviolent resistance, whose names and personalities they know, but who, in other situation, they treat with condescension, stone-throwing, verbal abuse, and vandalism. Encroaching upon a set of villages in the South Hebron Hills is Firing Zone 918, an area the Israeli military has designated as a training site, and which currently threatens 1,300 Palestinians with home demolitions and eviction from their villages. Israeli human rights organization B'tselem has pointed to one element of the problem, the fact that soldiers will often turn a blind eye to blatant settler violence. It is particularly striking, when visiting Hebron, to hear about the many forms that Palestinian nonviolence has taken, from a friendly greeting to settlers on the streets, to nonviolent demonstrations against the closure of Shuhada Street, to educating tourists on the realities and challenging conditions of Hebron life for Palestinians. In contrast, there is violence both in language and in action, perpetrated by Hebron settlers. One weapon is the simple and sweeping denial of Palestinian identity, labeling Palestinians in Hebron as the "Arabs of Eretz Yisrael," for example. This negation of identity falls treacherously into the larger pattern of Palestinian displacement and militarily sanctioned discrimination in Hebron, such as the use of checkpoints, street closures, and a consistent soldier presence. 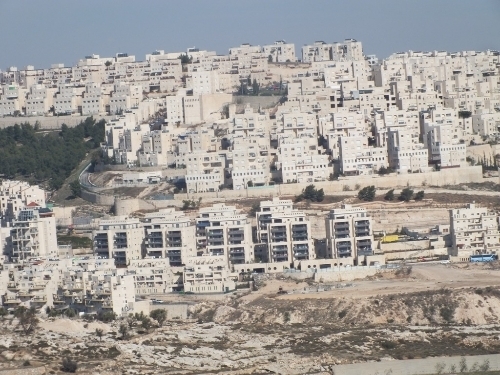 It facilitates misguided settler claims to a historic and religious entitlement to the land, and makes it possible for the tense coexistence, in Hebron, of competing realities: one in which the occupation is real, and restrictive, and a blight to human dignity, and another in which occupation cannot be conceived of, because it would require recognition of the legitimacy of Palestinian identity. While nonviolent resistance, education, and solidarity from the international community play a key role in stimulating a change in the power balance, the language of occupation still poses an insidious threat to the respect for a thriving Palestinian identity. 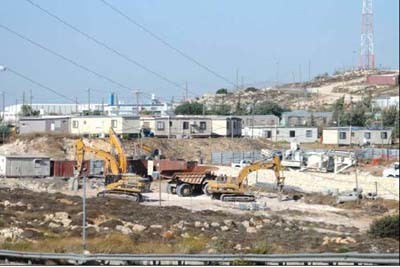 Israeli occupation authorities (IOA) on Saturday handed out notices to demolish Palestinian house and agricultural installations in the village of Koum near al-Khalil, south of the occupied West Bank. 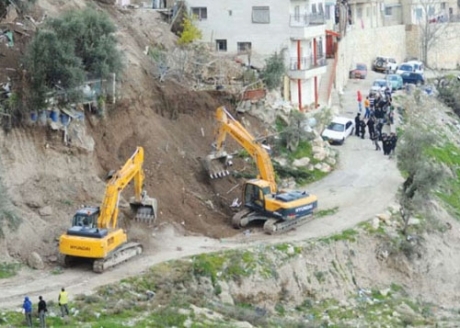 Local sources told Quds Press's correspondent that elements of the Israeli civil administration stormed the village at the early morning hours and ordered a citizen to demolish his house under the pretext of "illegal construction." They added that the civil administration team also notified another villager from the town of Koum to demolish water wells used to irrigate his agricultural lands under the pretext of the wells' proximity to the Apartheid Wall. The Israeli occupation authority (IOA) plans to convert a historical Islamic mosque in occupied Jerusalem to a synagogue, Haaretz newspaper said. The newspaper said that the Israeli antiquities authority intends to remove all Islamic features of Nabi Dawoud (Prophet David) Mosque in Jerusalem after it was vandalized by Jewish settlers. 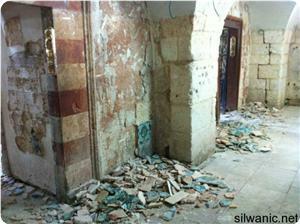 Extremist Jewish settlers stormed the Mosque recently and embarked on smashing its ceramic and marble walls, which dates back to the Ottoman era. Instead of repairing the damage caused by the settlers, the Israeli antiquities authority decided to Judaize the Mosque, which was built in the seventh century, and turn it into a synagogue. A youth group in Hebron on Saturday organized a protest vigil to demonstrate against Israel’s Prawer Plan, which could displace thousands of Bedouin residents of the Negev from their land. Youth Against Settlements organized the protest action as part of wider actions to protest the displacement plan of some 40,000 Bedouins in the Negev. "We gathered here today, both local and international activists, to highlight that the Zionist entity is committing premeditated crimes," Badee Dweik, a spokesperson from the group, told Ma'an. "This is racism, displacement, ethnic cleansing and discrimination against Palestinians," he said, adding that human rights groups must lobby against the displacement plan. Protestors in Hebron chanted slogans denouncing the Prawer Plan and urged Palestinians to close ranks and unite so as to be able to support their compatriots in the Negev to struggle against "oppression and discrimination." Hundreds of Palestinians protested in the Negev on Thursday against the controversial plan. A lawyer who joined the rally, Shihdeh Ben Berry, told Ma’an there was only one goal behind the protest and similar protests -- to thwart the Prawer Plan. "The people of Israel suffered in the past by the Nazis, and today they are mirroring their suffering against Palestinian minorities causing them to suffer the same and even more," he said. The absentee properties office in Israel refused Thursday to freeze the evacuation order of a Palestinian family in East Jerusalem, locals said. Karim Siam, a member of Siam family who got the evacuation order, said that his lawyer informed him that the absentee properties office refused to freeze the evacuation order. The office asked the family to pay 40,000 shekels in rent value to freeze the order. Siam explained that the office told his lawyer to appeal the decision from Aug. 1, 2013 within 45 days. He said that if he did not pay the money, the order would be carried out and the house evacuated. Jerusalem Gov. Adnan al-Hussini has pledged to put up half the money, Siam said. 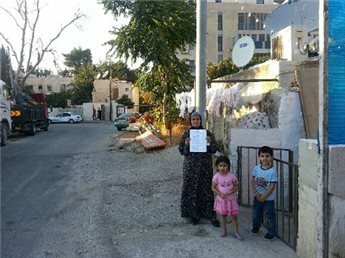 In July, after a six year legal battle to prove ownership of the property, an Israeli court decision ruled that the house is absentee property and ordered the Siam family to leave the premises by the end of July. The family was also ordered to pay 40,000 shekels ($11,200) as a rent supplement and 20,000 shekels ($5,600) to the court. The family of eight says it has lived in the property since the 1960s. The Israeli Magistrate Court has recently ruled to evict a Palestinian family from its home in East Jerusalem’s Sheikh Jarrah neighborhood under the pretext the family was not a “protected tenant,” Kareem Siyam, who lives in the house, said Thursday.The court was ruling on a Jewish settler group lawsuit that claimed the house was owned by Jews decades ago and therefore they want it back. Siyam said the Israeli Custodian of Absentee Property demanded that the family retroactively pay over 40,000 shekels (more than $10,000) for back rent on the house. Tenants who were present in the property prior to 1968 are considered “protected” and therefore the owner cannot evict them or increase the rent. Siyam said that his mother had lived in this house since 1968 while his family continued to live in the house since 1980 and have never relinquished their right as protected tenants. The family is planning to appeal the court ruling to freeze implementation of the eviction order until a final decision is reached. The Custodian of Absentee Property gave their lawyer up to 45 days to appeal. 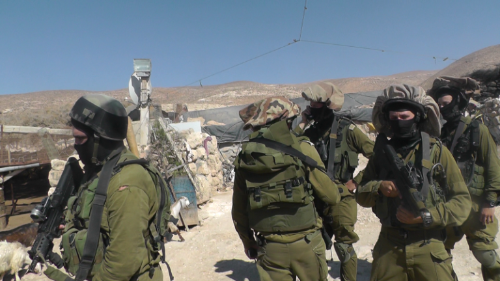 The Israeli Occupation Authorities (IOA) are working to evict 1,300 Palestinians from their villages in al-Khalil in the southern West Bank, under the pretext of conducting military training. "The state wants to evict 1,300 Palestinians from their homes in an army firing zone in the West Bank in part because training there saves the Israel Defense Forces time and money", Haaretz newspaper stated, adding that settlers in the Israeli random settlements in the area will not be evicted. The Israeli General Prosecutor introduced papers to the Israeli Supreme Court on Tuesday issuing the displacement of some 1300 Palestinians living in "the shooting area 918" in south Mount Hebron will save sources and time. Petitions were presented to the Israeli prosecution to cancel the Israeli military order to deport the residents of 12 Palestinian villages established decades ago. The newspaper pointed out that the military order does not include the Israeli random outposts built in the same area. The Israeli authorities ordered to deport the same villagers in 2000 under the same pretext, but the court decided at that time their return to their villages until the final ruling in the case. The Israeli occupation authorities (IOA) decided to raze 20 shops owned by Palestinian Jerusalemites at the entrance to Shufat refugee camp. The Israeli higher court endorsed the decision at the request of the Israeli army at the pretext of security requirements to expand the military passage in the separation wall. One of the Dajani family members, who own the shops, told the PIC that the warehouses were built in 1963 that is 50 years ago over an 11 dunums area. He said that the lands were appropriated over two stages seven dunums in the first stage and the stores and two and a half dunums in the second. He said that the decision followed a six-year court struggle during which the family suffered huge financial losses. He said that the Israeli army seized seven dunums during the construction of the separation wall to open passages, build rooms, cabins and others. US Secretary of State John Kerry estimated in conversations with Congressmen that Israel will retain 85% of the settlement blocs in a future peace deal, Yedioth Ahronoth Israeli newspaper reported. According to the newspaper's report, Israeli and Palestinian negotiators who recently met in Washington have discussed, along with the timetables for negotiations, the fate of the West Bank settlements and the possibility of land swaps. 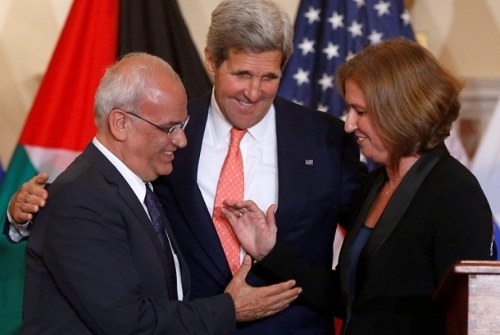 The report revealed that Kerry have phoned Israel's Minister Tzipi Livni, Palestinian negotiator Saeb Erekat and several congressmen to report about the talks. Kerry assured the congressmen, most of whom were pro-Israel, that Israel's interests are being safeguarded. According to one of the congressmen, Kerry said he believed 85% of Israel's biggest settlement blocs will remain under Israeli sovereignty." He added that the US administration had safeguarded Israel's interests. The congressman, who described himself a true friend of Israel, asked Kerry whether the Palestinians will ever recognize Israel as a Jewish state, to which the secretary of state reportedly replied "that's one of my goals. A homeland for the Jewish people," the newspaper also reported. 17:00 Central demonstration A’ra-A’ra’ra entrance (Triangle). 15:00 Ramallah action, gathering at Qasr Alhamra. 16:00 Gaza protest at Unknown Soldier Square. Hebron, details to be announced soon. 21:00 Jerusalem protest at Damascus Gate. 15:00 Dublin, Ireland protest, in front of the Israeli Embassy. 15:15 Amman, Jordan, Human Chain on Jordan university street. 16:00 Toronto, Canada protest in front of the Royal Ontario Museum. 17:30 Washington DC rally, meet at US State Department. 18:00 London, UK protest in front of the Israeli Embassy. 19:00 Beirut, Lebanon protest at Jamal Abd Alnaser Square. 20:00 Logroño, Spain protest in front of the Spanish Government Office in Logroño. 21:00 São Paulo, Brazil protest at the Paulista Avenue, corner of Rua Augusta. 21:30 Aden, Yaman protest meeting at Lutfi Jaafar School. 22:00 Rabat, Marocco protest in front of the Maroccan Parliament. 23:00 Nouakchott, Mauritania protest in front of UN offices. Organize your local event and join the global action. Your voice against ethnic cleansing and racism, matters. (Email the campaign at StopPrawerPlan@gmail.com). Background: Prawer Plan passed the first reading int he Israeli Knesset on June, 24th, 2013. It aims to displace between 30,000 to 40,000 Palestinian Bedouins, uproot approximately 40 villages and confiscate over 850,000 dunums of land. For more info please click here and here. This article was originially posted by ABIRKOPTY. Click here to view the orginial article.